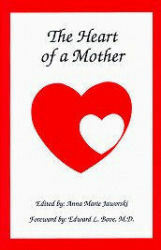 After writing The Heart of a Mother, Anna became more in demand as a public speaker. Now, instead of just sharing her own personal stories, Anna was able to share many people’s stories. She also had a son with hypoplastic left heart syndrome (HLHS) who was starting to grow up and she had wonderful stories to share about his life dealing with a severe, congenital heart defect. Anna spoke at conferences for CHD parents, retreats, fund raisers, and also for Congenital Heart Defect Awareness Day activities. 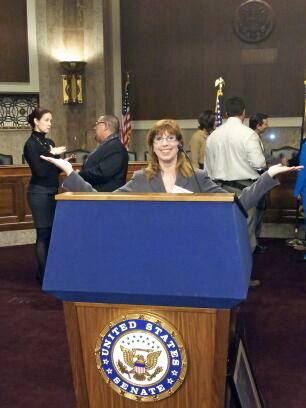 The photo at the top of this page shows Anna on the Senate floor in Washington, D.C. where she, her heart-healthy son Joey and members of the Adult Congenital Heart Association gathered together for Advocacy Day. In 2001 Anna joined Toastmasters, International. This is an international organization designed to help people improve their communication and leadership skills. Anna is now a Distinguished Toastmaster which is the highest level of achievement any Toastmaster can attain. Anna credits her Toastmasters friends for helping her improve the quality of her speech writing and delivery skills and also for helping her become excited about public speaking.